Download the demo game here. To play the demo, you will need the latest version of your favorite Glulx interpreter, such as Gargoyle, Windows Git, or Zoom (see links at right). Users of the Spatterlight interpreter are advised to upgrade to Gargoyle. To date, the demos that I’ve released for Glimmr Canvas Animation have been either simple visualizations, or have gestured at nonstandard interfaces that have not really been seen in parser IF before. Which naturally raises the question: what can animation do for the vast majority of text games–the ones that are just text? This new demo, Animated Title Page, is one answer to that question. In recent years, there have been some developments in the way that IF games present themselves at start-up (and before), including the increased use of cover art, largely thanks to Emily Short’s cover art drive from a couple of years back, and the growing popularity of “title pages” (see, e.g. Make It Good, or Jon Ingold’s plug-and-play I7 extension). This Animated Title Page demo continues this trend. 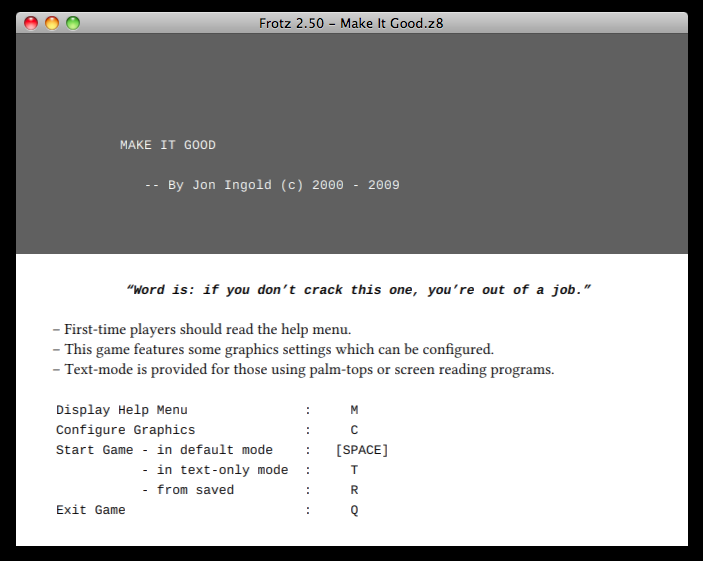 In contrast to most IF, which opens with nothing more than a couple of paragraphs of text and the famous blinking cursor, Animated Title Page suppresses the main text window in favor of a graphical presentation, showcasing the cover art along with a list of basic options, such as starting a new game or continuing a saved one. 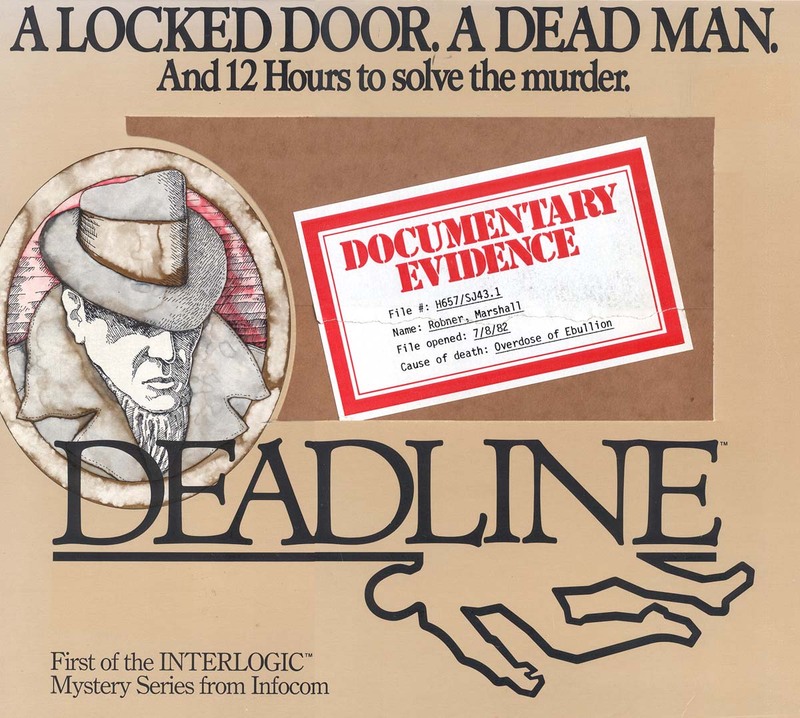 The demo, which pretends to be the classic Infocom game Deadline, also prefaces the title page with a fun and overly dramatic animated rendering of the original game’s marketing tagline: “A locked room. A dead man. And twelve hours to solve the murder.” This text rushes out at the player, making a whooshing soundas it rockets by. There are also fade-ins and fade-outs, animated button depresses, and other effects. It is worth noting that, despite the dynamic animations, the demo is actually quite simple from the standpoint of art creation. The art consists entirely of rasterized slugs of type (made using the font Dirty Headline by S. John Ross of Cumberland Games), and of a single photo (sitting by emdot). These elements are animated together using commands provided by the Glimmr Canvas Animation extension. Similar designs should be well within the capabilities of most authors. The source code for the demo is available at the link below, should you want to try to modify it for your own purposes. The demo is substantially complete, but there are a few more refinements that could be implemented. It would be nice, for example, to be able to skip the animations entirely to fade in directly on the title screen; it’s probably a bit much to have to watch even 20 seconds or so of introductory animation every time that you open the game. More radically: Nearly all other modern games, from casual to triple-A, employ an automated system of save slots so that the player never has to interact directly with the filesystem to manage her saved games. Such a feature would be easy enough to build into a Glulx project, and of course save slots would be a natural fit for a graphic interface like the one presented here. Download Animated Title Page, or the source code and assets. Comments welcome. Download the demo game here. 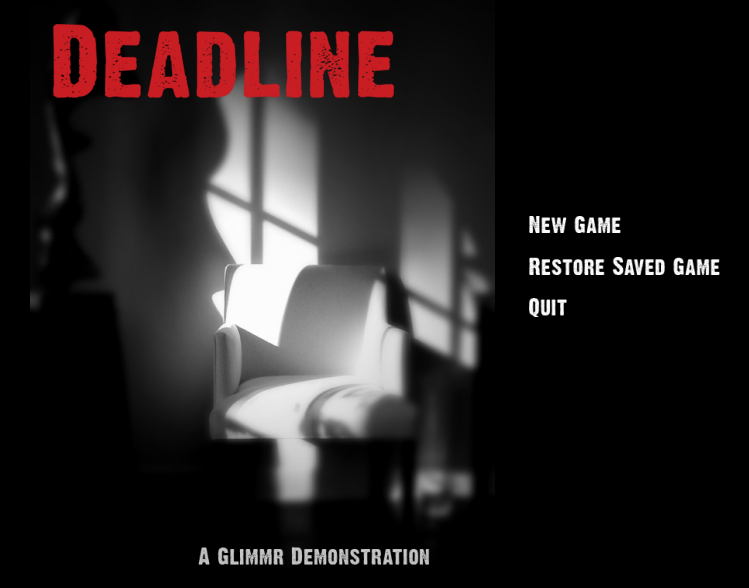 To play the demo, you will need a Glulx interpreter, such as Gargoyle, Windows Git, or Zoom (see links at right). Users of the Spatterlight interpreter are advised to upgrade to Gargoyle. Note: This post goes into a bit of detail about certain animation concepts. There’s even some math. I wouldn’t blame you if you just want to skip to the demo. For this installment of the demo series, we delve deeper into the facilities that Glimmr Canvas Animation provides for dynamic tweening. Briefly, “tweening” is short for “in-betweening”. In traditional animation, animations were organized around key frames–the critical points in any sequence. These keyframes were drawn first, and then the “betweens” were filled in to connect those key moments smoothly; because they were less critical, they were often filled in by the lower ranks of the animation team. In computer animation, keyframes are defined by the user, and the tweening is done automatically by the software. NOTE: The demo game file is a gblorb file. To play it, you will need a Glulx interpreter, such as Gargoyle, Windows Glulxe, or Zoom (see links at right). Gargoyle is expected to give the smoothest performance on all systems, but the most recent of any of these interpreters should do nicely. Almost exactly four years ago, I released my first “work” in Inform 7, a pre-Glimmr extension to enable very simple and primitive animations. Graphical Window Animation hasn’t worked with any Inform build newer than 5Z71; with Glimmr well underway, I saw GWA–limited to just one graphics window and (effectively) one image–as a dead end and didn’t bother to continue maintaining it. Instead, I set my eyes on eventually capping the Glimmr suite with a powerful animation library that would move well beyond the simple flip book approach taken by Graphical Window Animation. I dithered for a long while, thinking that before I put the extension together, I’d like to have a sophisticated system of virtual timers running behind it (Glulx has only a single timer, but you could theoretically track things in such a way as to imitate any number of separate timers firing events independently). I didn’t have a whole lot of interest in creating that system, though, so I just let things languish.